A team of chefs at IMPACT showcased their true potential as they won the ice carving competition (team category) which was part of the Thailand's International Culinary Cup (TICC) 2018 held in conjunction with Food & Hotel Thailand 2018 on September 5-8, 2018 at BITEC Bangna. The victory underlines IMPACT’s leadership in the service sector and professionalism in catering services that meets international standards. Bangkok, Thailand, 12 September 2018 - BMAM Expo Asia 2018 (“BMAM Expo”) presents a comprehensive platform for facilities management in response to the digital era; opens today and runs until, 14 September 2018 at Hall 5-6, IMPACT Exhibition Center, Bangkok, Thailand. BMAM Expo features a wide range of products and services, including FM products and services; innovation and IoT; security products and services; green building technology; cleaning products and services, from over 150 exhibiting companies and brands. Running alongside BMAM Expo is a series of conferences and seminars to enhance and develop modern facilities management for smart building and smart factory. The opening ceremony of BMAM Expo was graced by Mr. Banjoon Suntathat, Deputy Director General, Department of Industrial Works. Medical Devices ASEAN 2018 (“MDA 2018”) – the international exhibition and academic congress on medical devices, technologies, services and general healthcare – opens today and runs until Friday, 13 July 2018 at Hall 1-2, IMPACT Exhibition Center, Bangkok, Thailand. This trade exhibition features a comprehensive range of products and services, including general surgery; orthopedic surgery and rehabilitation medicine; radiology and diagnostic imaging; medical laboratory; IT in healthcare; medical instruments and consumables from more than 150 brands and companies around the world. Running alongside MDA 2018 is the MDA Congress, a series of academic conferences to enhance and develop the potential of medical and healthcare professionals. The event is expected to welcome more than 4,000 attendees from the ASEAN countries. JETRO Bangkok (“JETRO”) and CEBIT ASEAN Bangkok 2018 (“CEBIT ASEAN”) signed the Letter of Intent, to foster the partnership and collaboration between the two parties. Japanese start-ups will be encouraged to expand their businesses to and in Thailand, under the ‘JETRO Innovation Program (“JIP”), at CEBIT ASEAN. 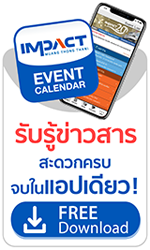 CEBIT ASEAN will be held from 18 to 20 October 2018, at IMPACT Exhibition and Convention Center in Bangkok, Thailand. IMPACT has signed an MOU on academic cooperation with Silpakorn University, Sodexo (Thailand) Co., Ltd., and ibis Bangkok IMPACT and Novotel Bangkok IMPACT to organise specialised training courses. The purposes of these 30-hour courses are to reinforce the performance and potential of personnel among the four partners to meet the needs of the growing MICE industry in Thailand and to strengthen their interorganisational relationships. SILMO Bangkok 2018 kicks off today with the aim to promote Thailand as the regional stage for manufacturers, dealers and distributors to showcase their latest eyewear collections, lenses, equipment and business services to optical professionals in the ASEAN region. More than 250 local and global companies and brands gather at SILMO Bangkok 2018. In addition, seminars focusing on current sales and digital marketing trends are held concurrently. Over 4,000 visitors from optical chain stores and retailers from ASEAN are expected to attend the expo. SILMO Bangkok 2018 opens its door from today until 22 June 2018 at Hall 4, IMPACT Exhibition Center, Bangkok, Thailand.